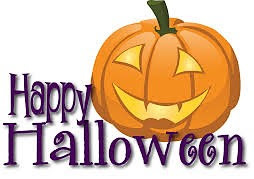 It's Halloween again and grownups and children alike around the world will be excitedly dressing up in costumes, going to parties, trick-or-treating from door-to-door for candy and carving pumpkin lanterns. 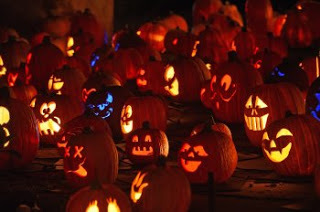 But Halloween wasn't always all just about making merry and trying to create the prettiest, scariest or the most shocking costume – its roots are both Christian and Pagan. Join us as we take a look back at the origins behind the jack-o'-lanterns, the ghosts and the ghouls behind All Hallows' Eve. A fire broke out at a Housing Board flat in Punggol on Tuesday (Sep 25) involving a personal mobility device (PMD) that was left charging in the kitchen. At the scene, SCDF personnel saw black smoke billowing from a unit on the 4th floor of Block 326C Sumang Walk. 3 people were rescued from a HDB flat in Senja Road after an e-scooter battery pack caused a fire. In a Facebook post on Sat night (March 10), the Singapore Civil Defence Force (SCDF) said it responded to the blaze in a 3rd-storey unit at 636C, Senja Road, at 9.05pm. Firefighters had to force their way into the flat through the front door, & extinguished the fire using a compress air foam backpack and a water jet. Mr Eduardo, a tenant of a condominium unit at Cote D’Azur in Marine Parade, can testify to that. The 39-yr-old Australian narrowly avoided getting seriously injured after the water heater in his unit exploded, ripped the bathroom door off its hinges, and blew out the bathroom window, The Straits Times reported. An exploding water heater – can you even imagine what that looks like? There have been other water heater accidents in the past, where people were electrocuted while using electric storage water heaters in the shower. But this particular case reminded us of a famous experiment done on Discovery’s Mythbusters, where they increased the pressure in a 200-litre water heater till it exploded. And of course, they caught the entire explosion – in all its glory – on camera. A storage water heater ruptured in a condo apartment at Cote D'Azur in Marine Parade on Saturday, resulting in smashed glasses of the door and windows of the unit's balcony. SCDF said that they responded to a call for help at 70, Marine Parade Road at about 5:10 pm on Saturday. The incident was believed to have involved the rupture of the storage water heater in the fifth-floor unit. There were no fire, and reportedly no injuries reported. However, the explosion was so strong that the glass doors and windows to the balcony of the master bedroom were shattered and sent fragments flying everywhere. It was also reported that a man had just stepped out of the toilet when the water heater ruptured, with the impact so strong it threw him onto the bed. A 39-yr-old Singapore resident escaped serious injury when a water heater exploded at his house on Saturday, October 1. The incident served as a warning to the public after the man shared photos of the damage and recounted his experience. The Australian tenant, who had moved to Singapore in June & was living in a condominium unit at Cote D'Azur in Marine Parade, said that he was reading a book on morality when the explosion occurred, reported the Straits Times. The electric water heater, which had exploded, was placed in the en-suite bathroom, and the damage was severe in the master bedroom as well. The bathroom door had flown off its hinges and the bathroom window had been completely shattered. The door had hit the bed, smashed the bedroom windows and glass doors of the balcony. The window, on the other hand, had landed almost 10 metres away from the building. However, no fire was caused due to the explosion. If he had not left the room to play with his daughter, the Australian tenant, 39, could have been seriously hurt in the explosion in his bedroom. 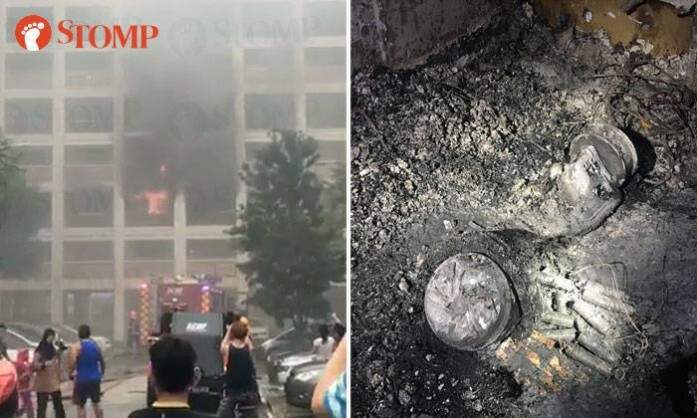 On Saturday (Sep 30) evening, an explosion was caused by a ruptured water heater in the master bedroom toilet in a 5th storey unit at Cote D'Azur Condominium at 70, Marine Parade Road. No one was hurt. Recounting the close shave, the Australian tenant, who works in corporate finance, told The New Paper he was reading his book on the bed in the master bedroom at around 4.50pm when his Korean wife called out to him to play with their 28-month-old daughter in the other bedroom. A minute after leaving the room, an explosion from the toilet in the master bedroom rocked the apartment. The impact sent their bed crashing out into the balcony. The blast shattered windows and doors flew off their hinges. Water heaters are 100% necessary these days, but very dangerous when not properly maintained. If you’re concerned about the state of your residential or commercial water heater, ALWAYS contact a trained water heater technician. We’re not suggesting your business is sitting on top of a ticking time bomb. Water heaters are generally very safe, especially when properly maintained. Just like your car or even electricity, water heaters are usually pretty safe and predictable when treated with the proper care and respect. Think about it this way: People drive, use electricity and use water heaters every day—but you only notice how dangerous these things can be when there’s a problem. So please, trust our expert advice—leave your water heater maintenance services to the professionals. Your water heating unit has a lot of monitoring sensors and alarms that aid in preventing things like fires and carbon monoxide leaks; professionals know exactly how to work with these, keeping your unit working optimally and safely at all times. Are water heaters in hot water? Instant Shower Water Heater Explode And Catch Fire! 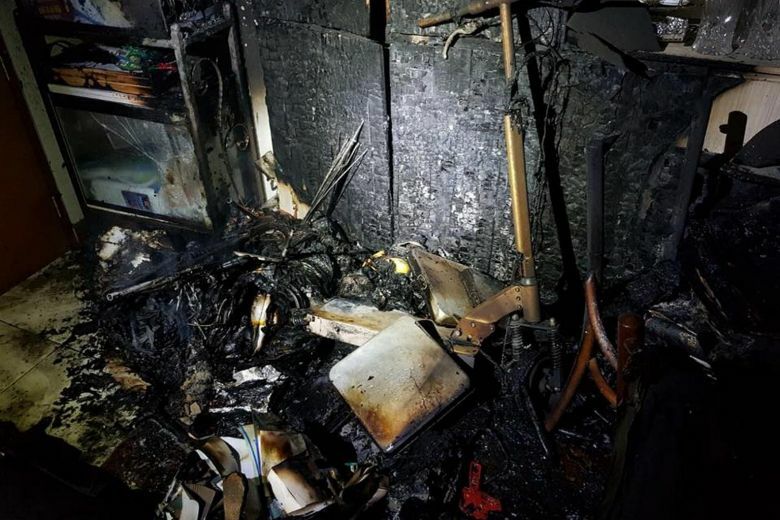 Part of a flat in Pasir Ris was destroyed after a fire sparked by an apparently overheated e-bike battery on Friday evening (Jul 8). The owner of the 5-room unit at Block 750, Pasir Ris Street 71 came home to find his living room gutted. Mr Andy Nini, 44, told Channel NewsAsia his children - a son and two daughters - managed to flee the fire along with their domestic helper. He got a call that his flat was on fire at about 7pm, & said his mother, sister and neighbour helped take care of his children. His wife, Nancy, a radiography technician, was not at home at the time as well. The aircraft painter said he had left his e-bike to charge by the window at about 3pm that day, then headed to work. "I don't know what happened to the battery. Suddenly it burst," adding that it normally takes about 5 hours to be fully charged. An electric bicycle that was left to charge overnight sparked a fire outside a Bukit Batok flat early on Thursday (Oct 12), with 4 neighbours including a 5-day-old baby taken to hospital. The incident occurred at Block 231, Bukit Batok East Avenue 5, at 3.50am, the Singapore Civil Defence Force (SCDF) said in a Facebook post. 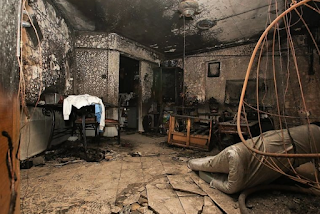 A living room and corridor were razed by the fire, which SCDF put out with a water jet. The e-bike that caught fire is believed to belong to the residents of a unit on the 2nd floor. A woman from that unit was taken to hospital. The device was being charged outside and was parked near the door of the opposite unit. A couple and their 5-day-old baby in that unit were also taken to hospital with minor injuries. The baby's aunt, who also lives with the family in the opposite unit, told The Straits Times on Thursday night that the infant is being monitored around the clock. Don’t leave your e-bike charging overnight: Fire Hazard! 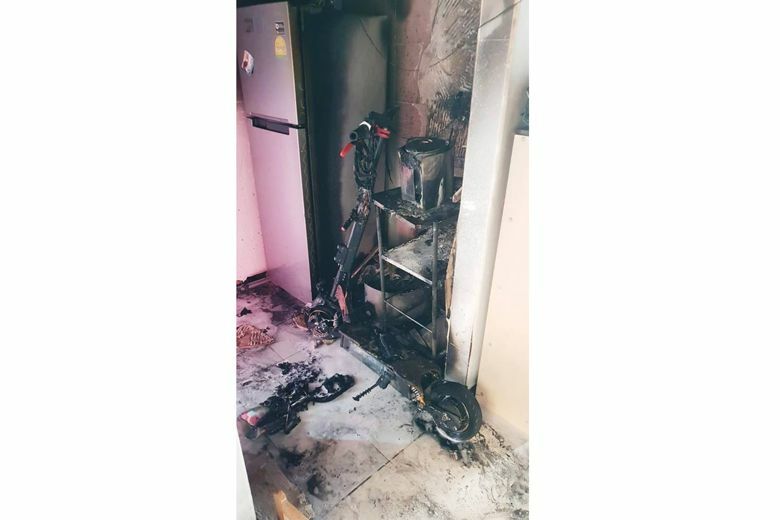 4 people including a 5-day old newborn baby were sent to National University Hospital after an electric bicycle (e-bike) left charging overnight caught fire in the common corridor of an HDB block. The incident happened at Block 231 Bukit Batok Avenue 5 at 3.05am yesterday. The 4 injured included the baby’s parents, the baby and a neighbour who lives next door. 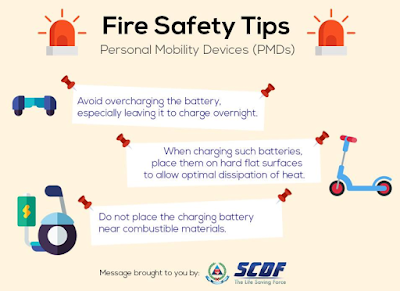 According to the Singapore Civil Defence Force, more fires were caused by batteries of e-bikes, personal mobility devices (PMDs) and power banks last year. 17 fires were caused by electric bicycles, up from 14 in 2015. According to the investigations, the fire was caused by an E-bike that was left to charge overnight. Avoid overcharging the battery, especially leaving it to charge overnight. When charging such batteries, place them on hard flat surfaces to allow optimal dissipation of heat. A fire broke out at Block 867A Tampines Street 83 yesterday (Jan 20) at about 5:30pm. Stomp contributors Fiveros, Xiao Pheyy, Shawn, Adriel & Maria alerted Stomp to the fire. Fiveros & Xiao Pheyy shared videos and photos from the scene of the incident. Don't leave your e-bike charging overnight...Fire Hazard! 700Bike Cyclo-X Bike | Bukit Batok / Bukit Panjang. 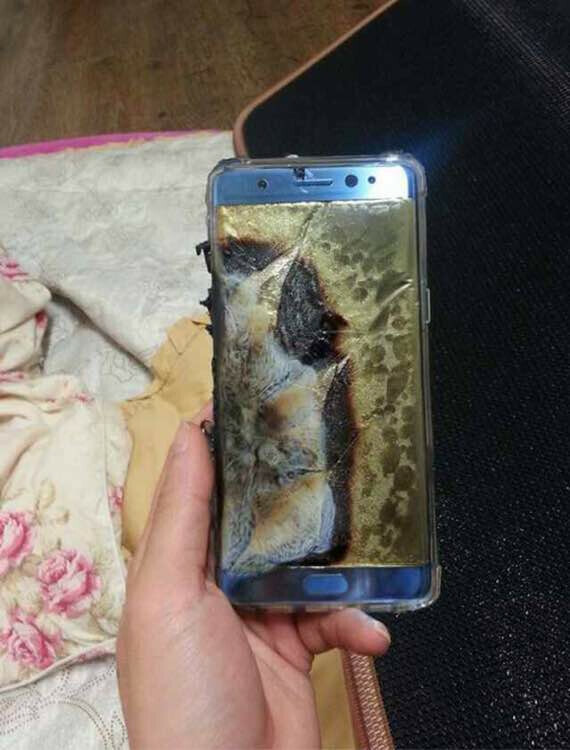 Samsung has announced it will suspend sales of its latest flagship smartphone Galaxy Note 7 after reports that some devices EXPLODED whilst being charged up. Samsung suspended sales of its Galaxy Note 7 smartphone on Friday, just two weeks after the flagship phone's launch, after finding batteries of some of the gadgets exploded while they were charging. 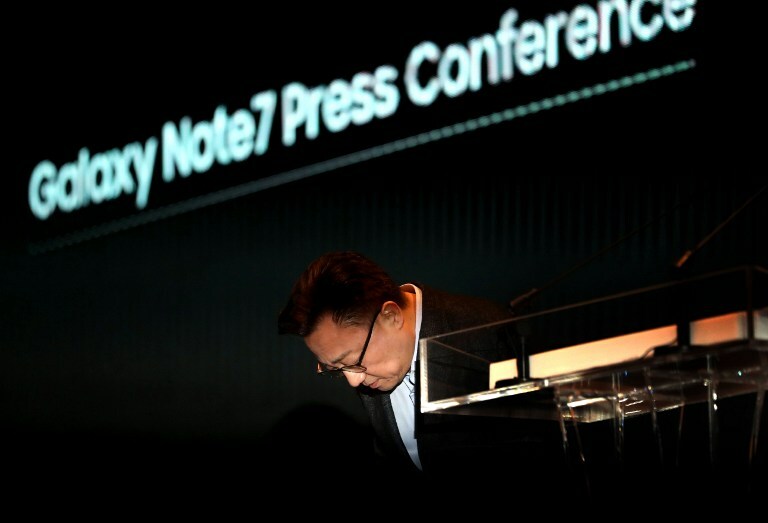 Koh Dong-jin, president of Samsung's mobile business, said customers who already bought Note 7s will be able to swap them for new smartphones, regardless of when they purchased them. The world’s biggest smartphone maker Samsung blamed faulty batteries on Monday for the fires that led to last year’s humiliating recall of its flagship Galaxy Note 7 device. Samsung Electronics was forced to discontinue the smartphone, originally intended to compete with Apple’s iPhone, after a chaotic recall that saw replacement devices also catching fire. The debacle cost the South Korean company billions in lost profit and reputational damage, in a torrid period which has also seen it embroiled in the corruption scandal that has resulted in President Park Geun-Hye’s impeachment. Samsung has announced it has permanently discontinued production of the Galaxy Note 7 in light of continued battery problems in replacement units. The official announcement was made just one day after the company halted global sales of the device. By now, you’ve probably heard about the whole exploding Galaxy Note 7 problem. It wasn’t too long ago that Samsung began recalling all Note 7 units it had shipped due to the risk of malfunction and fire, but now the situation has escalated far beyond that. The company has now permanently discontinued the Note 7 and stopped all global sales, which you can read about below. Since this is a developing story, we’ll update this page whenever new information comes to light. Here’s what you need to know about the Galaxy Note 7 recall and what you should do about it. The aftermath of a Galaxy Note 7 explosion is an ugly sight to see. Still brand new, the phablet has basically turned to charcoal. Unfortunately, no one can tell how the accident was provoked, only that it happened during charging with a microUSB to Type C converter for the cable. Hopefully, the issue won't be widespread, for that will put lots of customers in danger. For now, we can only recommend using original Samsung gear to charge your phablet, as well as keeping it far from sources of heat or water – in general, not just during charging. The accident seems to have happened in China, where the photos originate from. 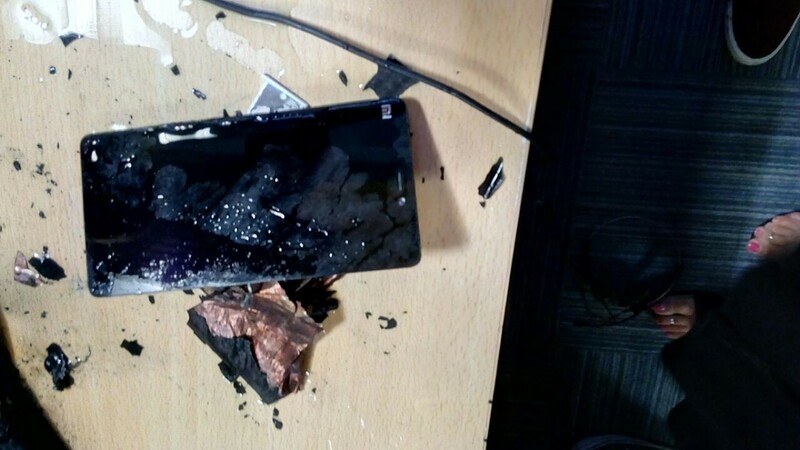 Last week, Xiaomi user ‎Ajay Raj Negi‎ posted to the Mi Mobile Facebook page about his phone exploding while in use. The incident happened on July 16, 2016 while he was in his office around his other co workers. Attached to his Facebook post is a video of the phone exploding. During the video, you can see that Ajay was using his phone while under standard office settings, when he suddenly jumped out of his chair and threw his phone. The phone then began to spark and caught fire. Luckily the situation was under control and no one was severely hurt during the incident. Pictures of the accident can be found below. Ajay did indeed mention that his unit of the Mi4i was purchased through Flipkart. We cannot confirm at this time that this incident is indeed Xiaomi’s fault, however. Xiaomi has however responded to a few concerned customers about the event, citing that they are currently investigating the incident to pinpoint a specific cause. Stories of phones exploding while charging, under physical pressure, or simply while using, have been around as long as smartphones themselves. It's a fact that phones are exploding and burning people, and these are no cheap phones per se. Recent reports have claimed that phones like iPhone 6, Mi 4i and Mi 5 are exploding and gravely injuring people. Now a Twitter user @gareth_clear today has posted a photo of himself, saying, "iPhone exploded in back pocket after bike fall. Skin graft surgery required". Even though Apple Support quickly responded to the Tweet by saying, " Let's see how we can help. DM us your current location and the details of your incident. We'll start there", the random occurrence of such accidents cannot be denied. All HTC phones may have similar exploding issues as Note7 in Singapore‏: This is as according to what HTC Singapore told me. My HTC phone exploded 1 week before issues about Note 7 came to light. The HTC phone model that had exploded in my room was a Desire 610. This had been a great phone for me for more than 1 year before it exploded. I was charging this phone with its official HTC charger for about 4 hours when I noticed the built-in battery had ballooned so much that it had pushed the non-removal back plate out of the phone. After removing the phone from the charging unit, I attempted to pressed the inflated battery down as I was hoping to get the back plate back onto the phone. That was when the battery expelled sparks and smoke then exploded into flames. No one was injured but I spent hours clearing smoke and cleaning soot in the room. I did not have warranty for this phone after more than a year then but I'll like HTC to investigate the cause. I sent the phone and charger in to HTC Singapore the following day. The following were the replies from HTC. Feel tingling electric current while charging iPhone 5s. Why do phones explode, and what can you do to protect yourself? iPhones are 'now EXPLODING' - but should YOU be worried? 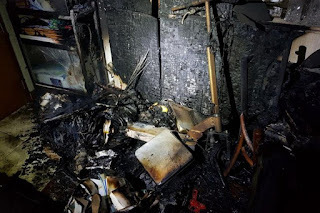 Samsung washing machine up in flames, Singapore family has narrow escape! A family in Singapore got the shock of their lives when their washing machine caught fire during use. 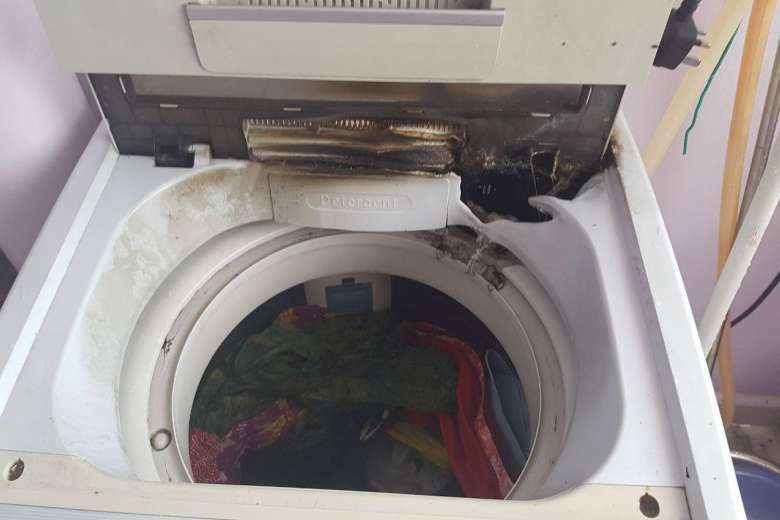 A regular day of laundry turned horrifying for a Singaporean family, when their Samsung washing machine caught fire while it was still in use. It was Nov 9, and close to noon time at the HDB flat in Block 469, Bukit Panjang. 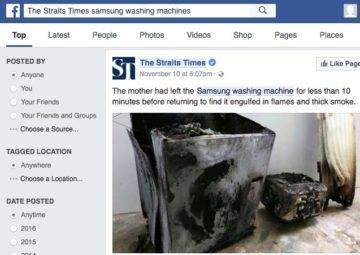 According to the Straits Times, the lady of the house had left her Samsung washing machine on in the kitchen toilet, for no more than 10 minutes, when she smelt something strange, only to find the machine up in flames and thick smoke! She was quick to grab her 16-year-old daughter and flee from the scene. The Singapore Civil Defence Force (SCDF) was alerted to the incident at around 11: 50 am. Thankfully, the family was left uninjured, and the blaze extinguished. We earlier reported that a Samsung washing machine burst into flames at a flat in Block 469 Segar Road in the Bukit Panjang area. The incident happened yesterday (9 Nov) at about 12pm. 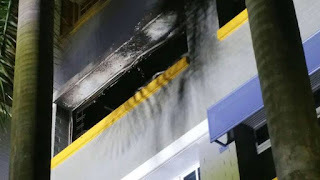 A resident of the flat in which the incident happened, Mr Rafiq (51) said that his 16-year-old daughter who was using the machine fortunately escaped being harmed by the burning machine. Besides his 16-year-old daughter, his wife (42) and another 11-year-old daughter were also in the flat when the machine burned. Do not install the washing machine in an area exposed to moisture or weather, or in an area which may be prone to water leaks. In the event of a water leak, allow the machine to dry naturally. Do not operate the washing machine if the power supply cord is wet. When cleaning the washing machine, do not spray water directly onto the washing machine and its parts. Avoid exposing the washing machine to direct flame. Do not use multiple appliances attached to the same outlet, as it may cause a power surge. If the power supply cord is damaged, please contact the manufacturer. A Samsung washing machine caught fire suddenly at a Choa Chu Kang flat on Thursday (May 11), the second such incident reported in six months. The machine was in spin mode when it caught fire at about 9.40am, Mr James Tan told The Straits Times. It caused a power trip in his house at Block 455, Choa Chu Kang Avenue 4. Mr Tan, 38, came out to check why the power tripped and detected a burning smell. Yesterday, she put her laundry in the machine and started it, then went to the kitchen. About 10 minutes later, she smelt a burning odour and went to check on the washing machine, and got a shock to find that it had burst into flames! The housewife hurriedly called the police, and also called her neighbours for help. However, by the time the neighbours came around, the fire was too big and smoke too thick for them to do anything. That’s when she grabbed her 16-year-old daughter and ran out of the house. Fortunately SCDF officers arrived in timely fashion to extinguish the blaze before it spread. No one was hurt in the incident, but the washing machine and all the clothes inside were burnt. It was suspected that the appliance is one of the many washing machine models that Samsung is currently recalling in North America, where nearly three million of them pose an injury risk — the lids of the machines can explode violently while the laundry is spinning. Samsung Electronics Australia has also initiated a product safety recall for six models of the washing machines that were manufactured between February 2010 and 2013. Samsung has assured us that this was not the case for the recent blaze here. After completing its own investigations, it said that the cause of the incident is likely to be due to the placement of the washing machine in a wet area. “Based on the available information, the cause of the incident is likely due to moisture from the bathroom where the washing machine was placed, which may have resulted in a electrical short circuit to the washing machine,” it stated. Another Samsung Washing Machine Catches Fire! This 7-year-old Samsung washing machine caught fire suddenly yesterday at about 9.40am at a flat in Block 455 Choa Chu Kang Avenue 4. James Tan put the machine in spin mode when it caused a power trip in in house. He went to check why the power tripped and smelt something burning. He then got a shock to see that his Samsung washing machines was on fire. Tan quickly used 2 pails of water to extinguish the flames. In the latest installment of Samsung products providing more bang for their buck, a television by the Korean manufacturer appeared to be emitting smoke in one Singaporean household. On Nov. 11, Facebook user Yeo Yen Leng posted to Samsung Singapore’s Facebook page a video showing smoke emitting from her television set after she switched on the power supply. Samsung Singapore has explained that possible wear and tear of a part in the TV was to blame for the sudden smoke. “We had gotten in touch with the customer yesterday evening and worked with her to determine the cause of the incident. The customer was using a Samsung TV model : UA55ES6200MXXS which was purchased 4 years ago. Fresh from exploding incidents, Samsung responds swiftly to smoking. Samsung washing machines in the US recalled! On 6 Jan 2017, just 6 days into the new year, newspapers reported that the authorities, SPRING Singapore, are warning the public against the use of the following gas cookers. Given the living standards in Singapore today, most of us prefer to cook at home when we’re able to. A gas cooker hob is also known as the built-in gas stoves in our kitchens. Chances are, if you’re still living with your parents, you won’t know what brand the cooker hob belongs. All you know about them is how to start a fire and to remember to turn it off after use. After this, it might be a good idea to check your cooker hob’s brand and model before they explode on you. Product safety authorities in Singapore on Friday (Jan 6) issued a product recall for four models of Electrolux glass gas cooker hobs following reports of "small explosions". SPRING Singapore told consumers to immediately stop using Electrolux’s glass gas cooker hob model numbers EGT9637CKP, EGT7637EGP, EGT7637CKP and EGT7627CKP that run on town gas. These models were sold from 2014 to 2016. SPRING Singapore said it received reports of glass shattering and small explosions when the affected glass gas cooker hobs were in use. In April 2016, it was alerted to a case where an Electrolux glass gas cooker hob shattered, and it issued a letter of suspension to Electrolux to stop the sale of affected models. SPRING Singapore announced earlier today (Jan. 6) that users of Electrolux gas cooker hub models EGT9637CKP, EGT7637EGP, EGT7637CKP and EGT7627CKP should stop using them as there were reports of small explosions when the hobs were used. Since news of this broke, a netizen by the name of Sam San has come forth to say that he was scalded on the left arm when he used the EGT9637CKP model from Electrolux. Homeowners with Electrolux gas stoves, please take note. If you bought an Electrolux gas cooker hob sometime between 2014 to 2016 and it’s one of these affected models – EGT9637CKP, EGT7637EGP, EGT7637CKP and EGT7627CKP, stop using the stove immediately. If you don’t know where to find your model number, look below the stove. For those with drawers below your stove, you need to remove the drawer to see the back of the stove. Spring Singapore warned this morning that the above models of glass gas cooker hobs by Electrolux could potentially explode. 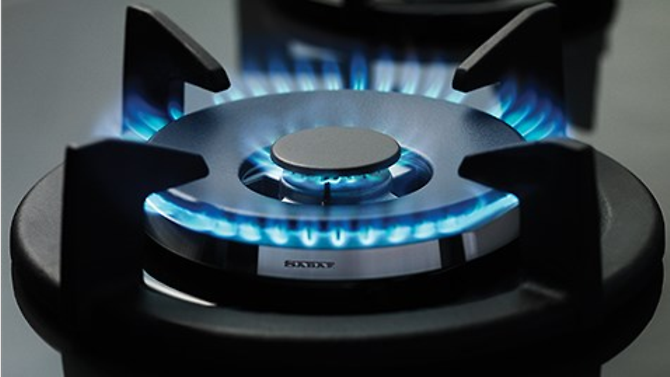 The agency said it “has received reports of glass shattering and small explosions when the affected glass gas cooker hobs were in use and is currently investigating the matter.” According to Spring, a user has been scalded by the cooker hob explosion. Electrolux apologised for causing any inconvenience and said that consumers with affected models should contact them by email (customercare.sin@electrolux.com) or phone (6727 3614 or 6727 3699). In fact, Electrolux has been working closely with Spring on this matter since April last year. On 13th April 2009, around 1100 hours. My grandmother was cooking some soup using the Technogas cooker hob which we own. The unit was then seven years old. After she boiled the soup for approximately half an hour, she switched it off and settled down at the dining table to have her lunch with my grandfather. The dining table is just 120cm away from the cooker hob. The time was approximately 1145 hours. About 1220 hours, there was a very loud explosion; following of shattered glass. I rushed into the kitchen to investigate. To my horror, I found many small pieces of glasses on the floor from the “shattered” glass of the cooker hob. I cleaned up the glasses immediately to prevent any one getting an injury and called up the customer service officer from Techno Shop Pte Ltd and their technician was called in for the investigation on the same day. Reports of another glass top gas stove that shattered when used are doing their rounds today. This time, it happened in the Pasir Ris home of Ms Suzalinah Saidee on Sunday. Luckily, no one was near the Turbo Italia kitchen hob when it exploded. Recently, Electrolux recalled four models of its glass gas cooker hobs, following reports from customers of glass tops shattering while in use. Which brings to the next question, is it not save to use kitchen hobs anymore in Singapore? Especially when the glass shatters, someone could get seriously hurt one day. Time for investigations and assurances that these are just isolated incidents, and that these people were simply the few unlucky ones. SPRING Singapore is issuing a product safety advisory to alert consumers to stop using Electrolux’s glass gas cooker hob model numbers EGT9637CKP, EGT7637EGP, EGT7637CKP and EGT7627CKP that run on town gas. These models were sold from 2014 to 2016. SPRING has received reports of glass shattering and small explosions when the affected glass gas cooker hobs were in use. In one case, it resulted in a user being scalded as a result of this incident. SPRING is currently investigating the matter. Consumers are advised to stop using the affected models supplied by Electrolux S.E.A Pte Ltd with immediate effect. Husband dies after explosion while preparing aromatherapy diffuser. Wife recalls his words while waiting for ambulance. The family were in the master bedroom while Mr Mohd Rizalludin Hassan, 35, went to its bathroom to prepare an aromatherapy diffuser. It had been their nightly routine since the haze started. Mr Rizalludin, an engineer, would light up the diffuser in the bathroom before taking it into the room. But it went terribly wrong on the night of Oct 13. His wife, Madam Nurul Asyikin Norman, 34, was helping their oldest daughter, Anggun Ardini, eight, with her mathematics revision. Madam Nurul's mother, Madam Juraidah Nabi, 53, was playing with the other three children - five-year-old Ayra Arinah, three-year-old Aariz Anaqi and 10-month-old Ana Auliyah. Then they heard a loud sound coming from the bathroom. A 35-year-old dad dies after unfortunate explosion after lighting aromatherapy diffuser. Wife recalls his last words while waiting for the ambulance. According to The New Paper, while his family were in the master bedroom, Mr Mohd Rizalludin Hassan, 35, went to its bathroom to prepare an aromatherapy diffuser. Since the haze started, it was a nightly routine for Mr Rizalludin, an engineer, who would light up the diffuser in the bathroom before taking it into the room. But it went terribly wrong on the night of 13 October. His wife, Madam Nurul Asyikin Norman, 34, was helping their oldest daughter, Anggun Ardini, 8, with her mathematics revision. A screengrab from a video put up by an aromatherapy retailer on how to use a diffuser. The website where Madam Nurul Asyikin Norman saw the promotion for essential oils has two videos - One is how to use an aromatheraphy diffuser and the other has safety measures to be taken when using one. After filling the diffuser with oil from the essential oil container, wipe off any spilt oil from the diffuser and your hands. Close the oil container immediately. Before lighting up the diffuser, remove the oil container from the immediate vicinity. 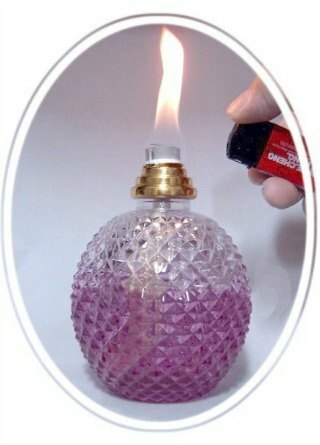 After lighting up, blow out the open flame after two minutes. Position the burner head away from the reach of children and pets. Keep the container of oil away from open flames. Do not have a lighted diffuser next to you when filling up additional diffusers. Do not leave the flame unattended. Always blow out the flame instead of using an object to suppress it. Do not try to light a diffuser with the flame of another diffuser. Jurong man dies from aromatherapy diffuser: What is a diffuser? Fire Fire Burn So Bright! Holy Smoke, So Many Fires! Fire Fire Burn So High! I may be the first person to give you this knowledge. This happens Every 1000 years. Then send this message to all your friends & within days the money 💸 will surprise you. Saturday 7 October 2017 was a Wonderful Day! You read the date from frontward (7-10-2017) and backward (7102-01-7) they read the same numbers. Have a great weekend! Singapore's malls are one click away from irrelevance, though the investment trusts that own them are carrying on as if nothing has changed. The landlords don't appear all that perturbed; at least not yet. CapitaLand Mall Trust, the island's biggest retail real-estate investment trust, announced 2.78 Singapore cents (2 cents) in dividends last week, unchanged from a year earlier. That's an annual yield of almost 5.5 percent at a time when the 10-year Singapore government bond offers only 2.2 percent. The tantalizing premium is keeping investors hooked. I got this picture from Mothership and the picture was taken by Lim Weixiang. It shows how bad the shopping centres are in Singapore. Most shops are empty and tenants of other open shops are concerned. But do you know who should be blamed for this? Easy. The Internet and the greedy landlords. It was about 4 years ago when I was setting up a sound system for a restaurant. The owner of the restaurant, who came from Hong Kong, was bemoaning the expensive rents one had to pay here to the landlords. Apparently, the landlords here have a “take it or leave it” attitude as far as rent prices are concerned. Also, another thing is the prices of the car-parks here in Singapore. Just the other day while I was at Ocean Financial Centre to visit a client, just for a couple of hours, the car-park charges came up to $14! As for the Internet, check out Qoo10, Carousell and the other blog-shops online. You can get your shopping done online and delivered to your house. You do not have to go into town. I do most of my shopping this way and I suspect many others do too. So hopefully this gives a wake-up call to all those greedy and conniving landlords. Lower your rent. You do not have to charge a sky-high price for it. You are pricing yourselves out of the market and when people do not rent your premises, it is your own fault. It is an increasingly common sight these days in the heartlands: Spanking new mixed-use developments with rows and rows of empty shop spaces plastered with posters and banners screaming “For Rent” or “For Sale”. From Kensington Square along Upper Paya Lebar Road and Novena Regency to The Midtown @ Hougang and MacPherson Mall, to name a few, the retail slump — which first hit the prime shopping districts several months ago — is starting to bite suburban retailers, and the impact on strata-titled malls in housing estates is stark. At the real estate investment trust (Reit)-owned malls such as Jurong Point, Nex in Serangoon, Northpoint in Yishun and AMK Hub, landlords are pulling out all the stops through promotions and loyalty programmes to stave off the chill. However, amid the economic slowdown and uncertain job market, vacancy rates are creeping up and tenants are reporting lower earnings as shoppers tighten their belts, even during the festive period. Data from property firm Jones Lang Lasalle show that the average vacancy rate of suburban malls, including Reit-owned and strata-titled shopping centres, has more than doubled from less than 1 per cent in 2013 to 2.4 per cent in the fourth quarter of last year. 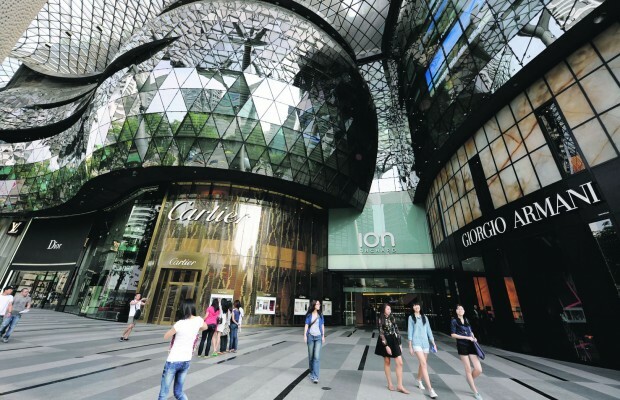 Average monthly gross rents for prime retail space in these malls have also fallen by 7.1 per cent in the final three months of last year, compared with the fourth quarter of 2015. The decline is catching up with the fall of 7.5 per cent in rentals for prime retail space in Orchard Road over the same period. But 3 years on, all but one of these crowd-pullers have shut or will move out by next month, as the retail slump claims yet another victim. American lingerie brand Victoria's Secret, Japanese fashion retailer Uniqlo & South Korean cafe Paris Baguette have already closed their stores at the mall, which is next to Raffles Place MRT. Travel products store Tumi, Swiss watch brand Swatch, Danish jeweller Pandora & shoe brand Melissa, have decided not to renew their leases and will shut soon. 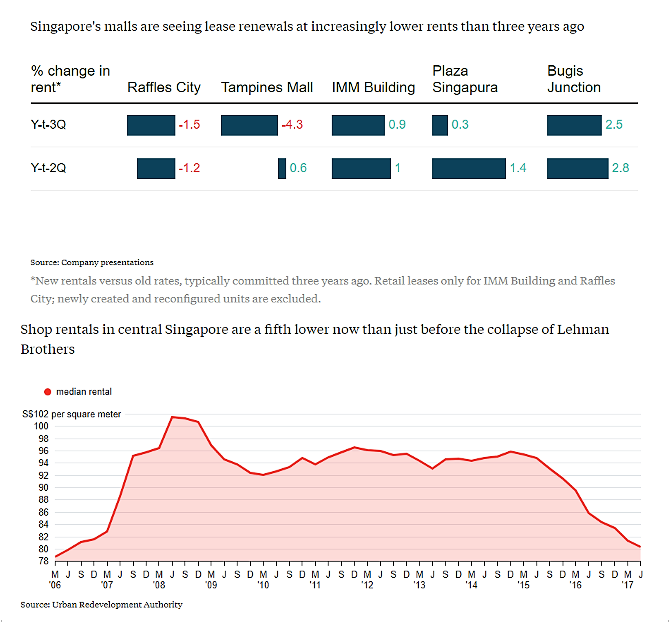 A check by The Straits Times last Friday found that of the 6-storey mall's 113 tenants, at least 14 have closed. At least another 13 will be moving out by next month when their three-year lease ends - which means nearly a quarter of the mall's retail space could be empty. WHY ARE SINGAPORE’S SHOPPING MALLS EMPTY? Despite opening its doors just a short 4 years ago, all it takes is a quick walk through JCube to see that a large number of their units are shuttered and devoid of tenants. John Little, the oldest department store in Singapore, is also shutting down its last store in Plaza Singapura soon. Statistics Singapore shows that the local consumer spending has increased to approximately SGD 35000 million in 2016, and yet, the vacancy rate for retail tenants is increasing as well. related: Why Are Singapore's Shopping Malls Empty? A walk through any of Singapore’s shopping malls nowadays, shows scores of empty shops as online retailers continue to kill off traditional retail outlets. This is what death looks like in Singapore; modern, newly renovated shopping complexes, with ominous and vacant boarded up shop fronts. Developments like Suntec City, which recently underwent a US$410 million redevelopment plan have whole sections standing completely vacant and are littered with newspaper covered storefronts, as more than 70% of the Singaporean population now prefer to shop online. The Singapore retail scene is in dire straits. Empty shopfronts dominate the landscape and the once thriving Orchard Road is a pale shadow of itself. A combination of lacklustre promotions, non-diverse retail mix (do we really need another Uniqlo?) and cheaper online alternatives have made landlords and tenants scrabbling for an antidote for their ills. Funan believes it has the answer. Although the new mall will only be officially opened in 2019, its developer CapitaLand just opened a retail show suite at the junction of Hill Street and High Street that is unlike any other showrooms we've been to. Centred around The Tree of Life, the show suite, which is opened to the public, is a wood and steel structure that houses a variety of open platforms and studios for local makers to hold events and workshops. You can also check out the new features and retail offerings that Funan has incorporated into the mall, including a rock climbing wall, a futsal pitch and garden patch for urban farmers, and a bicycle track that runs within the mall. It seems like that that time is now. Mall Vacancies Highest In A Decade. 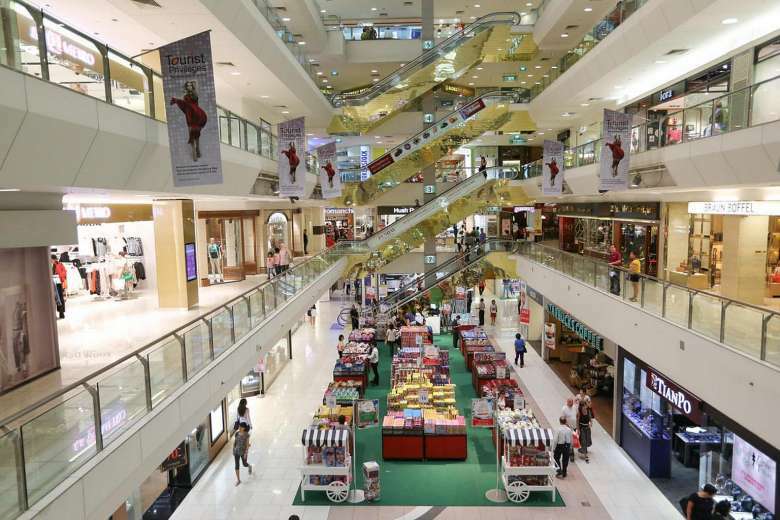 Singapore retail vacancies could worsen warns property consultancy Cushman & Wakefield (C&W). In a briefing paper, C&W says brick-and-mortar retailers will likely continue to consolidate store networks to address rising eCommerce sales and higher overheads. The company cited MasterCard data showing consumer confidence has fallen to its lowest level since June 2009 during the first six months of this year. According to Statistics Singapore, total retail sales (seasonally adjusted) increased 1.4 per cent in May 2016 over April. Excluding motor vehicles, retail sales increased an even better 2.3 per cent. But compared to May 2015, retail sales decreased 3.3 per cent after removing motor vehicle sales from the data. Including vehicles, total sales rose 3 per cent year-on-year. After seasonal adjustment, retail sales of watches & jewellery, furniture & household equipment, food & beverages, optical goods & books, department stores, apparel & footwear, medical goods & toiletries and petrol stations increased between 0.8 per cent and 6.5 per cent in May 2016 compared to April. Orchard Road's malls have come under scrutiny recently as several venerable department stores have closed shop and the latest addition to the sprawling shopping street, Orchardgateway mall, struggles to pull in consumers. Analysts have cited the weak yen as a cause of Orchard Road's troubles. Tourists who once flocked to Singapore for the shopping are now choosing to spend their money in Japan, they say. Yet this is only part of the story. 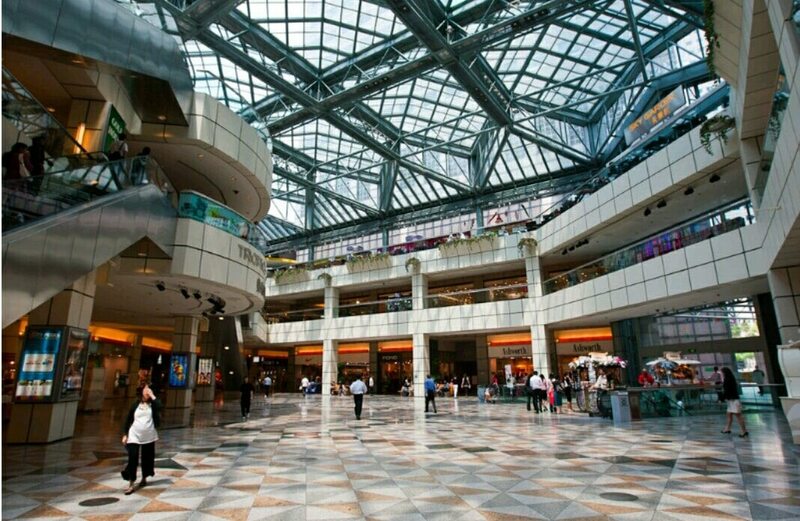 Reporters who went down to Orchard Road on 6th June found one of the major shopping malls in Orchard nearly empty, even though it was a Saturday. You've probably heard your fair share of how Singapore is going through dark times with its economy slowing down. Just to reiterate this serious matter, the Monetary Authority of Singapore (MAS) in its latest analysis and assessment of macroeconomic workings that affect our economy, indicated that 'an outright recession is unlikely' though we all should brace ourselves for a darker gloom cloaking our economy. If you haven't heard, here are 13 jobs in Singapore whose earnings have taken a hit. We sure hope you're not the ones affected, of course. Nonetheless, we at GET.com have compiled this list of 4 signs that suggest that Singapore is indeed facing an economic gloom. Even if you aren't trained in economics per se, you're probably well aware that trade makes up part of our GDP. So, you know it's bad news for export-driven Singapore when our non-oil domestic exports (NODX) numbers in Singapore dipped to their lowest ever in 3 years - March's 15.6 per cent decline was more dire than the expected 12.3 per cent fall economists had forecasted. On Orchard Road, Singapore's famed retail strip, the signs of change are easy to see: Venerable department stores have closed and a new commercial complex is struggling to gain traction with customers despite opening to much fanfare only a year ago. One reason often put forward to explain the trouble facing the district is the weak yen. Japanese tourists who once flocked to Singapore for the shopping are now spending their money at home. That is only part of the story, however. 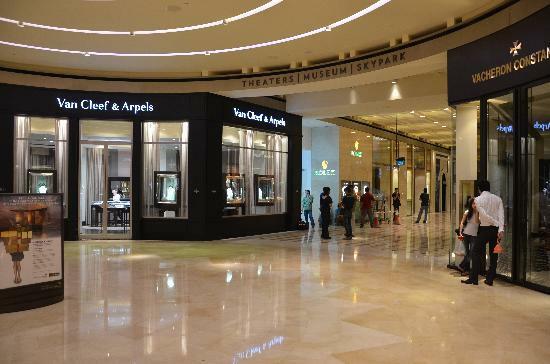 On June 6, a Saturday, a big shopping mall on Orchard Road was nearly deserted. And it is not the only one in trouble. It seems like just yesterday when all the cool kids were hanging out in shopping malls. These days, the only people who think the Orchard Road malls are cool are Chinese tourists and taitais with beehives. Everyone else has abandoned local malls in favour of hipster cafes in ulu neighbourhoods, and people now prefer to buy their stuff overseas or online. Heck, the fact that even Johor Bahru is now considered cooler than Orchard Road says a lot. Unsurprisingly, the malls that have pretty much taken over Singapore and strangled the life out of space-starved Singaporeans with their H&Ms and Uniqlos are now falling prey to vacant units. Potted plants are used to fill up space on level 2, where there appears to be more empty units than occupied ones. The Nihon Street, which features Japanese food outlets with a strong following, looks like it is still in the works, with sections behind hoardings. The entire section where Harvey Norman used to be has been cordoned off. A fitness & performance centre is slated to take over the space in October. Just how empty are Orchard Road malls these days? Indeed, it appears that Singapore’s beloved and world-renowned Orchard Road shopping strip has been hit by tough times. The inability to keep up with high rent, the arrival of big players muscling out smaller ones, the rise of well-stocked neighbourhood malls and online shopping are all factors that have impacted the performance — and general occupancy, really — of shopping centres in Orchard. But just how bad is the situation these days? We hit six malls earlier this week between 5:30 and 6:30pm to take a look for ourselves. The 2.2km boulevard has more than 5,000 retail brands & has pulled in tourists & locals alike for decades. It has faced and survived countless threats, including suburban malls, the rise of regional shopping hubs & even online shopping. Research analyst Eunice Khoo, of CBRE Research Singapore, said the shopping belt still has many things going for it, including Government support. In just over a year, clothing retailer Hang Ten has closed more than a 3rd of its stores. The 12 outlets, in suburban malls, had been bleeding money. Consumers were spending less but Hang Ten's landlords were still charging high rents, said its general manager Andrew Kee. "We started to close non-profitable suburban shops since Q4 2015 to reduce losses & just concentrate on a few strategic locations." After serving only a handful of customers in five hours on a recent weekday, Sam Goh said he was worried the sportswear shop he manages, LIV ACTIV, will eventually join other brands in leaving Singapore's Orchard Road shopping boulevard. Singapore's reputation as a shoppers' paradise, which saw investors pour S$10 billion ($7.25 billion) into retail developments here in the past five years, is taking a pummeling because of weakness in the local economy and a drop in spending by tourists. Commercial space has increased by a tenth in that period, but vacancy rates have risen to 7.3 percent from 5.0 percent and industry analysts expect them to keep rising. 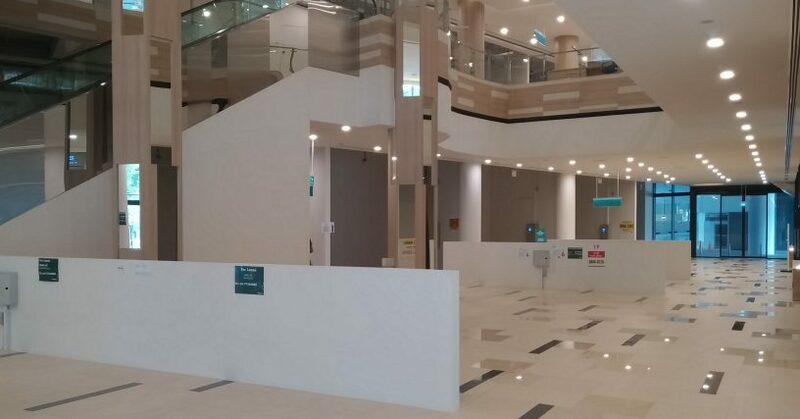 "Instantly when you enter this mall you see emptiness," said the 44-year-old Goh, whose shop gave up a quarter of its space last month to cut costs. IT IS now getting more common to see vacant units or large hoardings covering shopfronts as you walk along Orchard Road, and these are not always because of renovation works. More tenants are giving up their spaces along Orchard Road, the prime shopping belt, amidst a gloomy economy. Urban Redevelopment Authority data shows that the vacancy rate in the Orchard Road area rose 1.2 percentage points to 8.8 per cent in the first quarter of the year, apparently the highest in five years. Unfortunately, there is a vicious cycle to the retail industry, according to an ST article published on April 28. Imagine this: As customers walk past vacant or boarded spaces, they form a poor impression of that mall – one that would unlikely see them returning. This explains the decline in shopping traffic, which in turn discourages potential tenants from entering the retail market. It also creates losses for existing tenants, resulting in their exit from the retail scene. More units become vacant; the cycle continues. Next, the rising popularity of e-commerce. There is no doubt that online shopping has won the hearts of many – for its convenience, affordability, variety – and is increasingly the preferred choice for more people. Are there too many malls in Singapore? The other day I wanted to go to Kallang Leisure Park for some shopping but the taxi driver said that with the NDP rehearsals on that I should try another mall. I had my choice. Too much in fact. It got me thinking about whether there were really too many malls in Singapore and whether more time and resource should be spent on differentiating them with content and marketing. On my journey we went past 112 Katong (I refuse to call it the terrible marketing gimmicks name of "I want 2"), Katong V and in between there are two more malls being developed, and this was all in the space of a kilometre on one road. All of these malls are in the shadow of the enormous Parkway Parade. Then we made our way to the newly opened Paya Lebar Square and on the way passed the newly opened One KM -- all with virtually the same shops, just their competitors or sister shops -- and past the older City Plaza and sister mall. Surely too many malls in the same area for the catchment area? On first impression, everything here seems unnecessarily large and pretentious: the hotel lobby, the (attached) shopping mall, the casino itself, even guest room dimensions (which feel devoid of furniture as a result), so the hotel lacks warmth. The unique architecture has instantly made it the defining structure of Singapore's skyline and as such rates will remain at a premium as everyone wants to have "stayed there, done that". MBS charges more than equivalent Singapore properties, so it pays to book well in advance to get their best rates, especially when short notice cancellation is always possible. HIgher prices are charged for high floors and for the city views everyone wants (the other side being harbour view = a highway, construction on reclaimed land, and hundreds of ships at anchor in the Straits beyond). Many harbour facing rooms have balconies, whereas the city view rooms do not. If a sky-garden visit is on your to-do list in Singapore anyhow, then staying here will save you $20 each, with the bonus that you can swim in the rooftop pool and choose to go up there whenever weather conditions are right (not always the case!). Serious swimmers are advised to get their laps in at the crack of dawn before it gets too busy. Rooftop and views aside, there's little to do here other than walking around the oversized, impersonal, designer-heavy shopping mall, hitting the casino (take passports, be ready for a smoky environment on the main gaming floor!) and eating above-average priced food... until there is more to do here this is not the place to stay more than one night if you want to experience the 'real' buzz of Singapore. Unless your focus is gambling one night is plenty, and thereafter move closer to Orchard Road or the MarinaBay shops in that order of preference. You're connected to the rest of Singapore by taxi only - or else a potentially sweaty walk to Marina Bay via the shopping mall and Helix bridge. Beware taxi queues at certain times. Some staff are clearly still on a learning curve, not surprising in such an ambitious new hotel.